Alloy Composition: 43%Ag, 32%Sn, 25%Cu. No Zinc and No Gamma 2 Phase. The GK Amalgam capsule has good biocompatibility and operability. The filling material has good filling effects with low shrinkage and good sealing effect without looseness, falling off or breaking. The patients have no uncomfortable feeling during therapy. 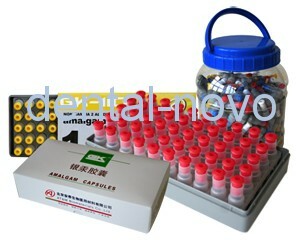 GK Amalgam capsule has been sold more than 100 million from 1987. Demonstration of effect after using GK Amalgam capsule.